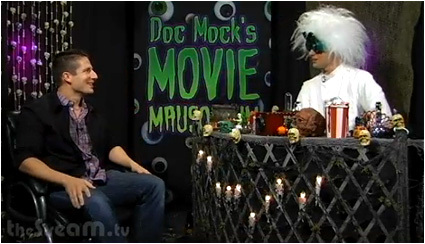 Matt Walsh Thanksgiving Episode of Doc Mock’s Movie Mausoleum Now Online! Ever wonder what it would be like to eat toxic chicken haunted by a desecrated Indian burial ground? Sure you have! And that’s why you need to watch our latest episode from last week! 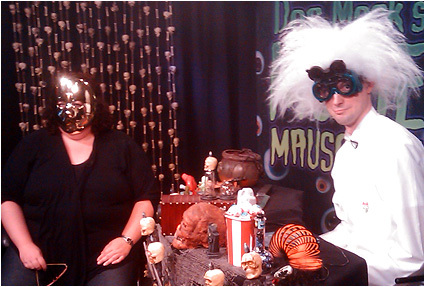 Yes indeedy, Episode 19 of Doc Mock’s Movie Mausoleum is now permanently archived online for your viewing pleasure! Big thanks again to our special guest Matt Walsh for joining in all of the rootin’ tootin’ turkey shootin’ excitement of episode nineteen and sticking around in the chat room with us for some dancing and other antics afterwards! Matt Walsh Appearing On Doc Mock This Friday, November 20th @10pm PST! Matt Walsh. You’ve seen him as a part of the Upright Citizens Brigade. You’ve seen him on The Daily Show. You’ve seen him in films including “Old School” and “The Hangover”. You’ll soon see him on his new show “Players” too… but before you see him anywhere else, you’re gonna see him LIVE on Doc Mock’s Movie Mausoleum this Friday night, November 20th at 10pm PST as our special guest! Yep, he’ll be watching a crazy movie with us and I couldn’t be more excited about it. He’s an extremely talented guy and I’m sure we’re all going to have a blast this Friday night. This also being our final episode before we go on a 1-week break for Thanksgiving, we have a few more surprises in store for you guys. If you have any questions you’d like to ask Matt, you should definitely catch the show live so you can send ‘em in via the chat rooms. If you have plans, cancel ‘em, because you don’t wanna miss this episode! Hope to see all of you guys there this Friday night! Ever wonder what it would be like to escape from a POW camp so you could dream of traveling to America to enjoy some chocolate milk and blue jeans? Sure you have! And that’s why you need to watch our latest episode from last week! Yes indeedy, Episode 18 of Doc Mock’s Movie Mausoleum is now permanently archived online for your viewing pleasure! Big thanks again to our special guest Julie Brister for joining in all of the gung-ho gore of episode eighteen and sticking around in the chat room with us for some dancing and other antics afterwards! New Doc Mock Episode Tonight! 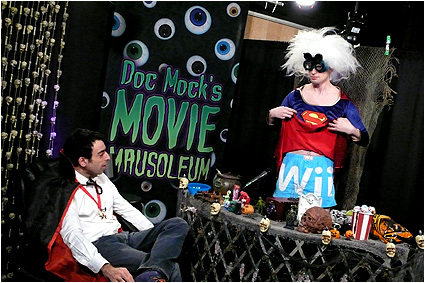 Please Nominate Doc Mock’s Movie Mausoleum For Best Online Video Web Series! While I doubt we’ll win since we’re such a new show and other established shows on Youtube have huge fanbases, it’d be pretty spiffy just to be one of the nominees! Many thanks to any of you who take the time to vote for us! We really appreciate all the support you guys have given the show so far! Ever wonder what it would be like if you could only shop for curtains and vases in the post-apocalyptic future? Sure you have! And that’s why you need to watch our latest episode from last week! 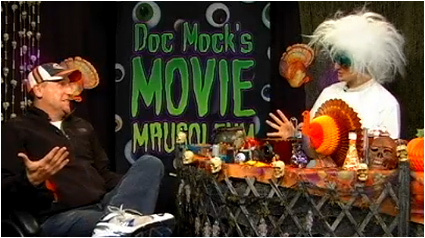 Yes indeedy, Episode 17 of Doc Mock’s Movie Mausoleum is now permanently archived online for your viewing pleasure! Big thanks again to our special guest Ben Siemon for joining in all of the merrily mutated mayhem of episode seventeen and sticking around in the chat room with us for some dancing and other antics afterwards! New Doc Mock Episode This Friday Night @10pm! Hope to see you guys in the chat rooms LIVE this Friday night!